) How does Yahoo know i am not using Windows XP ? Answer is your user agent , the browser communicates your user agent to any site you access. Any workaround?In Opera : No easy way, but in Firefox one can edit the useragent easily and that’s what’s going to help us. Step 1 : Backup Everything , Although the step doesn’t involve anything risky AFAIK, I still tell you to backup and release myself from liability. In this case just remember the key value that you are going to edit or even better make it blank! Step 3 : Right Click on any entry, Select new string and enter string name as ‘general.useragent.override’. You might want to replace the version at the end to suit your version of Firefox. Click on the image below to see the error Yahoo Mail Beta gives, i uninstalled Ubuntu so i cant confirm whether its started to work there, but people say it works in Dapper, See comments also. I can confirm though it doesnt work in Windows Me. 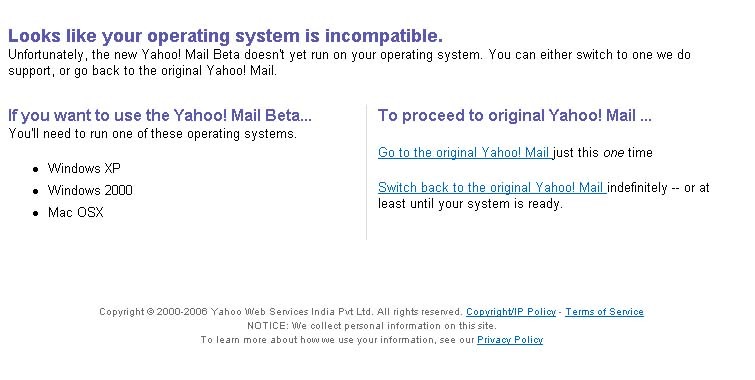 Never had any problem using yahoo mail beta in opensuse….. Upgrading to Firefox 2.0.0.1 should get you in as well. We don’t specifically block Linux users from using Yahoo! Mail Beta, so as long as you’re running on a supported version of Firefox, you should be all set. well i used to get errors earlier, guess thats fixed, but still in OS other than Linux, like windows Me , this offers a turnaround.